Movie Night on the Turf is a unique night of community building dedicated to the families residing in Adopt-A-Family programs. 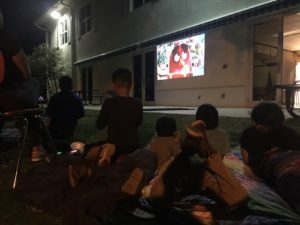 During movie night on the Turf, families are treated to popcorn, snacks, crafts, and pizza while viewing a family friendly flick on the Project Grow playground. The green space provides a clean, safe, and welcoming environment for our families to enjoy a movie while building community together. Movie Night is a perfect opportunity to spend time with the loved ones and your family. You can sit back, enjoy popcorn, snacks, and refreshments—all while enjoying a fabulous movie with your neighbors at Adopt-A-Family! – Adopt-A-Family Homeownership Success Story, Rose B. The event, which began with an initial attendance of 15, has grown exponentially over the past three years, and is an event our families truly enjoy. Movie Night on the Turf is open to corporate and individual partnership and sponsorship. Movie Night on the Turf quickly became a client, staff, and board event favorite. Truly a unique experience for our community, Movie Night on the Turf is held Friday evenings once a month between September-March. Corporate or individual sponsors are able to be as involved as much or as little with the planning and hosting of the event as they choose, and work closely with the Communications Coordinator of AAF to ensure the event is planned out in accordance with the sponsors requests and ideas. 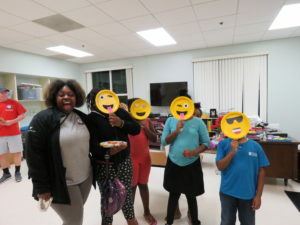 The magic of this event is felt when you see the smiles on the faces of both parent and child as they have this opportunity for a safe and fun family bonding opportunity.